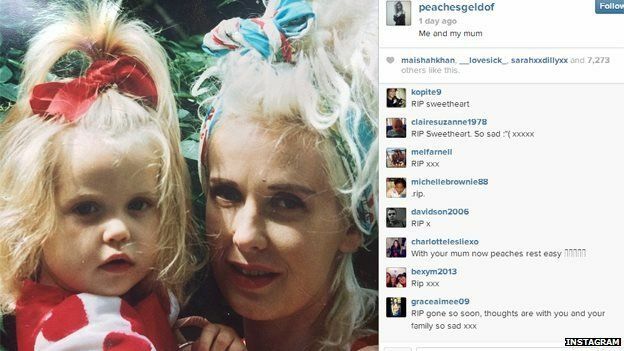 Peaches Geldof, second daughter of musician Bob Geldof and the late Paula Yates, has died aged 25, leaving a husband and two sons. Police, who were called to an address in Kent around lunchtime on Monday, say the death is currently being treated as “unexplained and sudden”. Geldof was 11 when her own mother died. TV presenter Yates died of a drug overdose in September 2000. In September 2012 Geldof said she had not been able to come to terms with her mother’s death for several years. Her father Bob Geldof said in a statement: “How is this possible that we will not see her again? How is that bearable? In a statement, Kent Police said: “Police were called at 13:35 BST on 7 April, 2014 to an address near Wrotham following a report of concern for the welfare of a woman. “A woman aged 25 was pronounced dead by South East Coast Ambulance Service. The writer and TV presenter was married to musician Thomas Cohen, with whom she had two sons, Astala, one, and Phaedra, who will turn one on 24 April. Peaches has died. We are beyond pain. She was the wildest, funniest, cleverest, wittiest and the most bonkers of all of us. Writing “was” destroys me afresh. What a beautiful child. How is this possible that we will not see her again? How is that bearable? We loved her and will cherish her forever. How sad that sentence is. Tom and her sons Astala and Phaedra will always belong in our family, fractured so often, but never broken. Bob, Jeanne, Fifi, Pixie and Tiger Geldof. “My beloved wife Peaches was adored by myself and her two sons,” said Cohen in a statement. Born in 1989, Peaches Honeyblossom Geldof embarked on a media career at the age of 15, when she began writing a column for Elle magazine. She left home at 16 and went on to contribute to the Telegraph and the Guardian, as well as TV shows including ITV2’s OMG! with Peaches Geldof. She also worked as a model and, just last week, attended a launch for Tesco’s F&F clothing range in London. Yates’s death came after she split with Bob Geldof and formed a relationship with INXS frontman Michael Hutchence, who then died in 1997. “I remember the day my mother died, and it’s still hard to talk about it,” Peaches told Elle in 2012. “I just blocked it out. I went to school the next day because my father’s mentality was ‘keep calm and carry on’,” she said. Geldof said she had experimented with drugs as a teenager, but was “never that wild”. She was previously married to rock musician Max Drummey but the pair separated in 2009 after a six-month marriage. 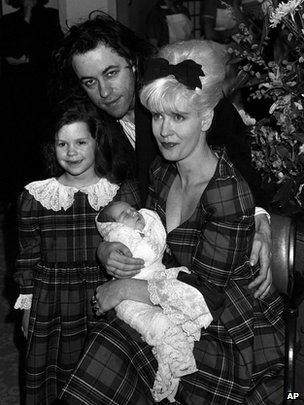 She leaves her husband and sons; father Bob Geldof; sisters Fifi Trixibelle and Pixie; and younger half-sister, Tiger Lily Hutchence Geldof. TV personality Kelly Osborne tweeted that “words seem inadequate 2 express the sadness I feel about @peaches_g death”. This entry was posted in R.I.P. Bookmark the permalink. Annabelle: Creation’ Star Grace Fulton Joins DC’s ‘Shazam!